With 35 knots forecast, the fleet launched with a little apprehension today but were rewarded with fantastic downwind rides in 15-25 knots and long, spread out waves that make Porthpean such a great place to sail. The B14 arrived at Porthpean Sailing Club on Thursday to sun and fantastic outlook to prepare for the Nationals. Friday arrived, rain and no wind. However, after a 1 hour postponement, The fleet launched. There would be a 2 hour delay between race 1 and race 2 whilst the fleet awaited the breeze. Throughout the races there was very tight racing at the front with a right old ding dong in race 1 between Team Harken (Nick Craig/Toby Tastic Lewis) and Team Gul/North Sails (Mark Barnes/Charlotte Char Jones). The latter pulled away and won as Harken battled with Demelza (Peter Knight/Jane Reeves) and Team North Sails/Troublegum (Alan Davis/Rich Bell). 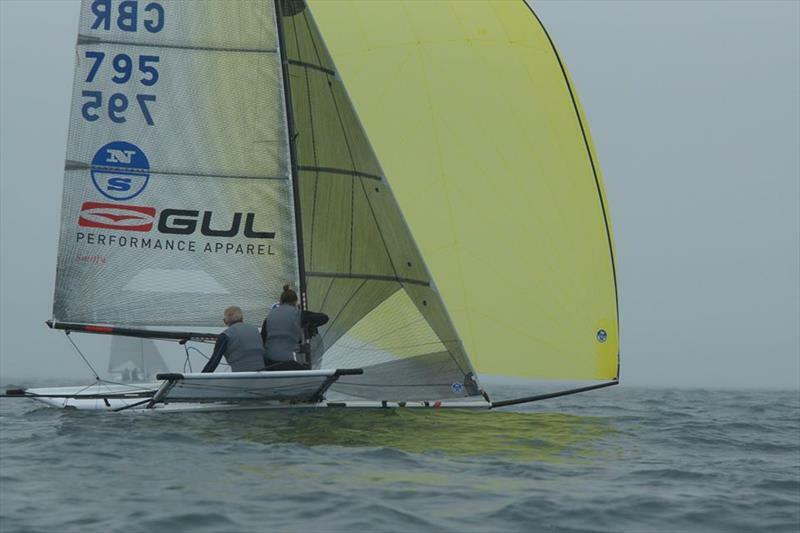 Race 2 was a repeat with the first 2 exchanging position but ending up with a repeat of the first race with the first 2 having nothing between them cross gybing into the finish, again going to Team Gul/North Sails. Current National Champion with Tom Pygall, Toby Tastic taking a break from nappy changing etc is looking to keep this team on song and holding on to the trophy in their fast Seavolution B14. Both having recently been at the Merlin Champs, they should be gunning for it with Nick looking to get another run at the Endeavour Trophy. Entry, SI and NOR links and more information on page.